Three Nigerian men who burglarized hotel rooms across Pattaya City, Thailand were arrested on March 27, police officers said in a statement. 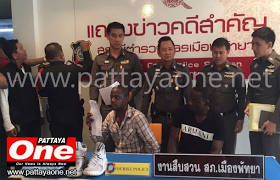 The men identified as Mr. Jaho Jaho Nonso, 30, Mr. Ugochukwu, 30, and Mr. Samuel Osas, 30 allegedly posed as tourists, checked into a Pattaya hotel, and burglarized it. According to investigators, during the months of August and September 2015, and March 2016, managers of ten hotels around Pattaya City have reported these crimes but were unable to catch them until now. Pattaya City Police cooperating with the Tourist Police, together monitoring CCTV around the City, gathered enough evidence to make the arrest of the Nigerian criminal group. Before arrests were made, Detectives knew that Mr. Jaho Jaho Nonso was residing at a hotel behind Tuk Com in South Pattaya on March 25. When police raided his hotel room, they discovered that the criminals have all fled and thought they have gone to Bang Phli, Samut Prakan. The police rushed to that area for fear that the criminals might escape back to their country. The Nigerian gang would rent a hotel room and they climbed from their room's balcony to other guests' tooms and take their belongings. They always focused on cash. Once done, hey immediately check out from the hotel and hide in small hotels. Investigators concluded that this gang burglarized eight hotels within the seven months period. The estimated total loss from hotel thefts were about 454,800 baht. They would be prosecuted according to Thai law on charge of robbery, illegal immigration and overstaying.